The Fight For The Mailbox Is ON! The most important goal of email marketing influencers is to increase the ENGAGEMENT RATE of email marketing. INTERACTIVE EMAIL CONTENT increases the Click-To-Open Rate, and according Martech Adviser, adding videos to your email content can Boost Click Rates up to 300%. 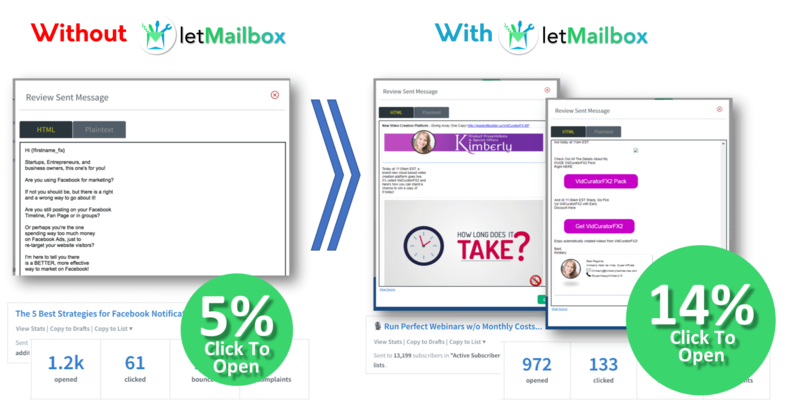 We put it to the test using LetMailbox Interactive ELEMENTS and TRIPLED our Click To Open Rate! "I am getting INSANE Results!" I've been using a software called video click magnets or easy web video so far and have been getting great click rates, but letmailbox blows it out of the water both on price and robust-ness. "Great Value for an Even Better Price"
Wow, you guys have done it again. What a powerful software! To me, the most powerful and especially relevant is the data ratings. When you see the results of the ratings you’ll see exactly what your subscribers like or not which is very useful information. Great value for an even better price! What if you can use more effective email tools to get your sales even higher, quicker and in less time with every broadcast you send? LetMailBox is an answer for all Email Marketers out there. Ever Since I started using it in my Business, I have seen a 9% Increase in my Click Through Rates, which definitely has lead to Increased Revenue for us. Has Never Been More FIERCE! Open rates of email have been decreasing over time. Email inboxes are being flooded with email messages from family and friends, colleagues, website subscriptions, your favorite on- and offline stores, clubs, and many more. The Silicon Valley-based research firm The Radicati Group recently crunched the numbers and found that 269 billion emails have been sent 2017 and that figure is going to keep growing at more than 4 per cent a year for at least the next five years. By 2021, there will be more than 319 billion emails whizzing around the world. So, how do you stand out in an OVERFULL INBOX? All These Companies Can’t Be Wrong. Don’t reinvent the wheel, if you can already use what works for multi-billion dollar companies! LetMailbox you can create emails that do the pre-selling for you. And with our mute button technology, you will see your clicks throughs skyrocket. Because who doesn’t want to hear the sound on a video, right? With LetMailbox you can upload any video and convert them into click magnete that you strategically place in your emails and starts autoplaying whenever your subscriber opens your email. But it doesn’t stop there… we have added the latest engagement, scarcity, personalisation & conversion technologies to this powerful app to get that result you are looking for - The CLICK! That click that lets your subscriber go to your webinar, offer, store or questionaire, you name it, LetMailbox will get you those click results! "If you do any type of Email Marketing, This is a MUST for You!" If you do any type of email marketing, this is one of the most useful tools you can have at your fingertips. Just one of the features alone is worth the price of the software, I especially like the auto-play video with click through linking. I have already seen an increase in not only opens, but actual clicks on the video element and the CTA buttons. The “Live” countdown timer, CTA buttons, Link Preview, and polling elements are amazing. It’s almost like having an unfair advantage when you’re affiliate marketing. You Rock LetX Team! "LetMailBox has made getting Results So SIMPLE!" I am loving the app so far. The video overlays, emoji feedback and the self destructing messages are just WOW! The click rates on my campaigns have increased and LetMailBox has made it so simple. Must try! Saurabh Bhatnagar, Founder - Geekotech, Inc.
"Unique, Look Great and Get Clicked"
"I'm sold! LetMailbox is the best tool I've used so far and I've tried many over the years. My first widgets took just minutes to create and add to my emails and website. They are unique, look great and get clicked. Really powerful. Two thumbs up for the creators of this tool." "$1,000 additional revenue from emails sent with LetMailBox elements"
We started testing LetMailBox about a month back and used it on the cart abandonment sequence for one of our new Shopify stores. The results have been massive so far! Email Open Experience And Make Them CLICK! That EVERYONE Wants To CLICK! LetMailbox Will Set The Standard For Email Content For Years To Come! BRANDING Your Emails The RIGHT WAY! With LetMailbox you can brand your emails the RIGHT WAY, by using attractive media and widget that LetMaibox creates, that you can strategically place in your emails with copy/paste simplicity. Works With ANY & ALL Major Autoresponders! Our growth multiplier elements will enable you to boost your messages through integration with social media. Integrate with YouTube, Vimeo, Instagram, Twitter, Pinterest and Google Maps. Choose your favorite colors for your conversion and growth elements to blend in with your brands color codes! Email Marketing Returns The Best ROI Online! Each Subscriber On Your List Looks Out For Value! AND Lets Customers Come Back For More! Whether you’re in real estate, shop owner, fitness trainer or affiliate marketer, anyone needs to showcase his or her’s precious assets and lead people to your offers. This is the best email promoting apparatus I ever saw,I adore the highlights like autoplay video with CTA and tally down clocks. I would state I have never observed anything that has ever created such a mind blowing RESULT in my open rates. I have to say after using this tool for less than 24 hours, I have seen both more clicks and more engagement with my emails. LetMailbox is awesome and will use this in my campaigns moving forward! LetMailbox Will GROW Your Business FAST! Choose your favorite autoresponder or email provider to use with LetMailbox! If you have any trouble using LetMailbox and we fail to help you resolve the issue, or if you have not been able to generate any results, we'll give you 100% of your money back. We don't offer a no questions asked refund, so please provide a genuine reason and proof that you did everything we told you before asking for a refund. Please read the sales page carefully before making a purchase, results vary for various niches and depend on various factors so they cannot be guaranteed to be the same as ours on this page. We do not promise that you are guaranteed to make money from this software. Connect with like minded Facebook and email marketers, entrepreneurs, agencies and other LetMailbox users! Strategize with the best in the field and get advice from your peers to get better and consistent results from your Email Campaigns. If you want to boost your clicks, then a call-to-action will motivate your viewers to do just that! With this LetMailbox Basic Image Editor addition, you can add MEME text on the image, and simply adjust your image with various basic effects and features. To make your Image standout, you can add any of the features shown below! And Get More Clicks To Grow My Sales! For a limited time, LetMailbox is available for a small one-time payment as a launch special. The price may change after launch to a monthly subscription at any time without notice once this special deal expires! When you get LetMailbox during this launch you will be grandfathered into LetMailbox. LetMailbox is created as SaaS Software (Software as a Service) and is cloud based. This makes LetMailbox accessible to all browsers and all Devices, as long as you have an internet connection! Yes, we will offer you the ability to obtain PRO Features and serve as an Agent for LetMailbox, but only during this launch week! A.If you have any questions or problems, you can open a ticket in our support desk. Go to [Contact Us] for that or email support@letx.co.